I had a single Exchange server 2007 (exchange1.intra) on my internal network. This server had the CAS, Transport and Mailbox roles installed on it. This server used an SMTP relay to send/receive emails (public name : mail.mycompany.com). Unfortunately, you cannot change your SMTP banner on your Exchange server if it has the mailbox role installed on it. 1- add another server (echange2.intra) to your Exchange organization with the mailbox role, move all mailboxes on it and remove the mailbox role from echange1.intra. 2- remove the default Exchange header (will hide that your server is running Exchange) on echange1.intra. cscript adsutil.vbs set smtpsvc/1/connectresponse "mail.mycompany.com My Company"
And your emails won't be rejected anymore. 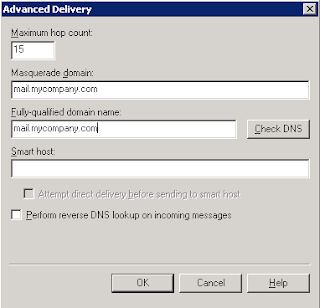 PS : if you have an SMTP virtual server (IIS), don't forget to put mail.mycompany.com in the masquerade domain and FQDN fields. i face the same problem, but i have 3 SERVER, MX, HUB+CAS in internal server and Edge server in DMZ ? Solution, NEVER use exchange as final server. 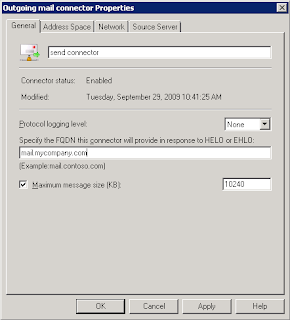 Post a linux server with a good postfix/sendmail config on it and relay from and to you exchange server. Saves you a lot of troubles. In step 4, why change SEND connector instead of RECEIVE connector?